I am not a person who visit beauty parlours and salons regularly. I do my facial myself and do not experiment much with hair colors or styles. In my twenties, I tried lots of different hair cuts and styles but then I stopped these things. Just stuck to some specific haircuts that suited my personality.In fact, I never tried hair colors till I hadn't noticed gray hairs. After noticing some grey hair I decided to apply hair color similar to my original hair color and I started to color my hair since two years. I never thought of highlighting my hair but it's my sweet and naughty daughter who wanted me to have it done. I was just planning for this change but was a bit confused as to where to go. 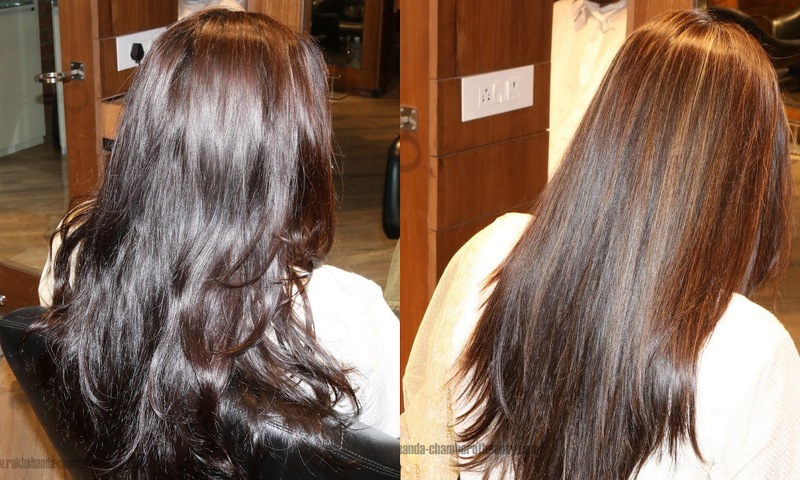 When I got an invitation from Geetanjali Salon to avail a few services of my choice I decided to accept it. I decided to go for two services there, first highlighting the hair and second a relaxing facial that I desperately needed after my injury. Geetanjali Salon (by Hair Expert & Celebrity Hair Stylist Sumit Israni) has opened up their new Concept Studio at Dehradun. The good thing is that the salon is quite near my residence and I can visit it easily. When I entered I was warmly welcomed by their receptionists. It was Sunday and the salon was crowded due to the holiday but the special treatment that they gave me was brilliant! The salon looks really grand & beautiful with the wooden interiors. Read on to find out my experience with the services I took. At first, I was up for a through consultation with their facial expert Meenakshi she introduced herself and asked about my skin type. She listened about my skin problems and then she told me to fill a form about my name,age, skin type and problems. This way they can keep their clients' records and give the treatment easily. My skin is sensitive and delicate and I often avoid getting facial treatments at every other salon. Often, I do that myself. She suggested me the Power C+ facial from SKEYNDOR but also offered me to choose any other from the list. However, I went with her suggestion. I was pleased to see the interior of the facial room that was neat and relaxing. Before starting the facial, Meenakshi started explaining me all about the brand, the products, she was going to use along with the other details about it and the procedure itself. She confirmed my comfort and then with the controlled dim lights and the music the facial was started with aqua pressure massage that was soothing, it helped in destressing and was really comfortable . I felt relaxed but that was just the beginning. She then started the facial and all I remember is feeling relaxed and comfortable due the soothing massage. After one and a half hour the facial was done and my final pack was wiped off with the hot towel. She finished her work by applying a sun block lotion on my face and neck. I felt rejuvenated and was feeling completely relaxed. My mind was calm and de-stressed. I really can't explain you how great it felt. After the facial, I saw the mirror and really loved the result my skin got with this facial. I thanked Meenakshi for this amazing experience. I loved her sweet and friendly nature. No doubt, I would love to take this treatment again and again. This Skeyndor Power C+ facial treatment costs INR 3000 at the Geetanjali Salon. The second service that I took was getting my dark brunette hair highlighted. Hair experts Rahul & Ali took the job of doing my hair. They asked me about my color preferences to understand what kind of color would suit me best. I seriously didn't have much idea about hair colours so left the decision to them. They went for a blonde shade from L'Oreal Paris Majirel Professional hair colours range according to my fair complexion. The entire procedure was quick and convenient. After the colour was applied, I was asked to wait for about one hour. There were lots of magazines to flip through, coffee and juice were offered at regular intervals. 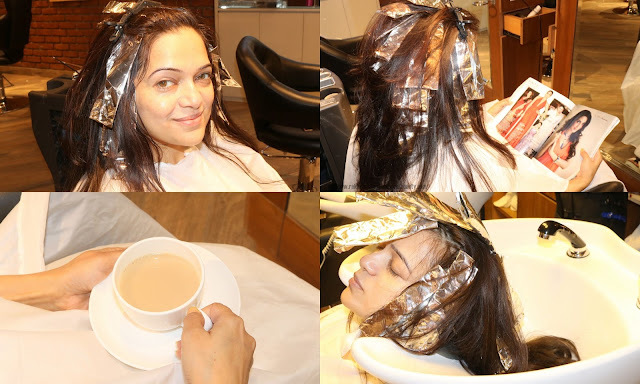 After an hour, the colour was washed off and further procedures were carried out. My hair was then blow dried in a few minutes, they straightened it so make the highlights stand out. I was really impressed with the result. The new colour merges with my original hair colour and looks beautiful. In fact, these highlights make my hair look shiny & healthier. The entire procedure took 2 and a half hours and was worth it! I'm totally satisfied with the both services at the salon. The results were fantastic. The salon is a beautiful place to visit when you need some pampering. They offer great services and even though the prices are a bit high, it's worth it! A special thanks to Priyanka, Pooja & the entire staff of Geetanjali Salon, Dehradun. Highly recommended!